It would not be hyperbole to claim that the past two decades were in many ways doldrums to the people of Ethiopia and Eritrea. They chronicle a heavy death toll and mayhem of the workforce of both countries, disruption of social interactions, displacements and destruction. 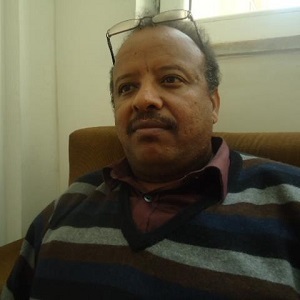 As the period was a dark spot in their yesteryear, the people of Ethiopia and Eritrea want to relegate them to the limbo of history once and for all. The chapter of bickering and conflict between the sisterly nations had been closed in May 2018. Ever since, the two countries have opened a new chapter of trust that warrants sociopolitical and economic benefits. It is to be recalled that it was a warm welcome Prime Minister Dr Abiy Ahmed received while he visited Eritrea thawing the ice. That was a sign of goodwill of Eritreans to their Ethiopian siblings. It is one that remains indelibly printed on Ethiopians’ minds. Similarly, pouring out to the streets, the warm welcome Ethiopians expressed to President Isaias Afwerki shows Ethiopians’ affectionate bond with their Eritrean siblings. These turn of events had shed light on the fact that nothing could put a divisive wedge for long between peoples of the two countries that entertain love in the heart of their hearts. On the wake of the visits leaders of the two countries exchanged and the peace talks they held, the historic people-to-people relation between peoples of Ethiopia and Eritrea is sprouting at an astounding pace. Forcefully separated for two decades, family members who were living on either side of the border were seen groping for each other’s faces awash in tears. This unforgettable unfolding is historic evidence that putting the two people asunder is a futile bid. It is also a showcase of the grotesqueness of war and the significance of peace. Thanks to leaders of the two countries, people of Ethiopia are walking in the streets of Asmara and Mesewa with square shoulders, likewise Eritreans in the streets of Addis Ababa, Bahirdar and Awassa, among others. 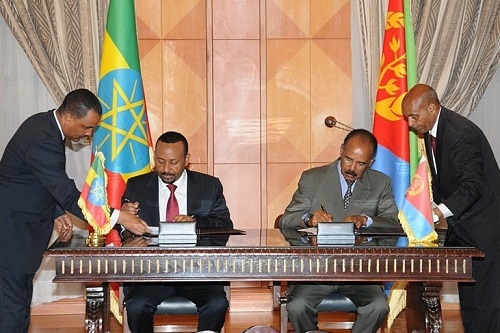 Also, the trade transaction between Ethiopia and Eritrea, especially between Tigray the northern tip of Ethiopia,and Eritrea, is ever on the rise. Apart from the state-to-state relations between Ethiopia and Eritrea, the people, public diplomacy is also proceeding at a fabulous pace. For instance representatives of the Amhara State and a spectrum of people drawn from various corners of the country had gone to Asmara to pay homage to the city and hold useful discussions. A similar people-to-people relation from Tigray State is also bearing fruits. Given the perks, this superb chemistry has to continue. The ray of hope that flickered from the relation of the two countries is spreading beyond the boundaries of Ethiopia and Eritrea. It has proved exemplary to the horn. The ongoing peaceful dialogue between Ethiopia and Djibouti as well as the tranquility that ensued in the horn are additional manifestations of the white dove hovering high in the skies of the aforementioned countries. The gesture of fertilizing peace is picking up steam. This week President Isaias Afwerki came to visit Bahirdar, the capital of Amhara State and Gondar town. It is to be recalled that lately, gracing the inaugural ceremony of Sugar Factory III in Omo Kuraz area with his august presence, he had accentuated the culmination of one of the country’s success stories. This visit of his opens another window to look at how people of the two countries entertain bonds of affection. It also paves ways to make the avenue of peace friction free. Bickering and war had costed the two countries a lot. None of them benefited from it. Contrariwise, the wind of peace is airlifting socioeconomic boons to the two countries. It is heartening to reflect that the two countries are contrasting the upside of peace and the downside of war. The fact that the two leaders had taken Somali’s President Mohamed Abdullahi aboard while visiting development activities Ethiopia engaged in to ensure food self-sufficiency here and beyond its borders tells on their commitment to turn the strife-torn horn into a springboard of development. The leaders had seen how Ethiopia is all out to tap its potential of arable land and water resources and how it aims to pull the horn out of an economic morass in collaboration with its neighbors. The event also shows the leaders’ conviction to emerge robust harnessing untapped resources. It sheds light on how emerging strong they could evade unnecessary influences to control the geopolitics of the horn.